Human beings are altering this world. Anthropogenic climate change is no longer a contested theory, but a fact accepted by the scientific community. It threatens to irreparably alter the planet by driving species to extinction; escalating the severity of weather; causing widespread droughts; magnifying national security issues; and enabling the spread of diseases and organisms to areas that will threaten ecosystem stability and agriculture. In the face of overwhelming evidence that human activities cause climate change, many companies continue to profit off of the extraction of fossil fuels, and the resultant release of damaging carbon emissions. The endowment of Dartmouth College is invested in some such companies. Our continued investment in the fossil fuel industry makes us active contributors to the environmental devastation and the human rights violations that result from climate change. We, the students of Divest Dartmouth, believe the College must divest its holdings in fossil fuel companies to address the hypocrisy and the lack of fiscal responsibility that they represent. The demands of Divest Dartmouth align mostly with the global Fossil Free campaign, which calls for institutions to “immediately freeze any new investment in fossil fuel companies, and divest from direct ownership and any commingled funds that include fossil fuel public equities and corporate bonds within 5 years.” (Divest Dartmouth does not ask the College to divest from commingled funds – only direct ownership – because the blended-account nature of commingled funds would make it extremely difficult to extract the fossil fuel accounts exclusively.) We ask Dartmouth to divest from companies on the Carbon Underground 200™ list, which has identified the “dirtiest” publicly-traded coal and oil-and-gas companies globally, ranked by potential carbon emissions from their reserves. Dartmouth’s investments in the fossil fuel industry run counter to our most fundamental institutional claims. First and foremost, these investments are a betrayal of the Native American communities Dartmouth claims to stand by. We advertise our commitment to Native American communities and students, yet we support the industries responsible for the exploitation of Native American lands, and most recently the atrocities at Standing Rock. More generally, this institution purports to educate and to better humanity; we list “integrity” and “responsibility for each other and for the broader world” as some of our core values. Yet through its investments, Dartmouth publicly supports the greatest threat to our world’s stability and survival. The irony of Dartmouth’s investments extends beyond our mission statement, to a core element of the institution’s uniqueness: the College has long prided itself on fostering a connection with the natural world. We tell prospective students about the Dartmouth Outing Club, welcoming them to campus with our unique First-Year Trips program, which allows first years to spend time in New Hampshire’s open spaces. Even our mascot, the Lone Pine, is a symbol of the ties to nature that define this place. Dartmouth’s investment in fossil fuel futures strips these traditions of their meaning, broadcasting our hypocrisy and degrading our integrity. The arguments in favor of divestment go beyond the ethical. There is also a substantive case to be made for fiscal responsibility. By divesting, we untangle Dartmouth’s financial future from that of fossil fuels, which offers an unstable and likely declining payoff. If major climatic catastrophe is to be avoided, policy must emerge that limits the amount of existing fossil fuels. According to a Nature study, this means leaving one-third of oil reserves, half of gas reserves, and 88% of coal reserves unused in order to limit global warming to 2 degrees Celsius. Thus, while opponents cite the negative fiscal impacts of divestment, we argue that the College’s finances would be minimally impacted in the long term. Dartmouth’s divestment alone will not slow the success of the fossil fuel industry; we have never argued that it would. But the divestment of a prestigious institution like Dartmouth has the potential to set off a cascade of divestments from other colleges and universities. Furthermore, attaching a stigma to the worst polluters in the industry could make it significantly more difficult for these companies to function smoothly. Finally, a reinvestment in clean energies could further the positive social impact of the College’s endowment. In order for the College to officially divest, the issue must be introduced and brought to a vote at one of the Board of Trustees’ quarterly meetings. Past divestments, such as those from South African apartheid and the tobacco industry, were proposed the President of the College, setting a clear precedent. Accordingly, responsibility falls on all Trustees – but on President Hanlon especially – to take fossil fuel divestment seriously. However, Dartmouth’s Board of Trustees has repeatedly refused to take meaningful action. 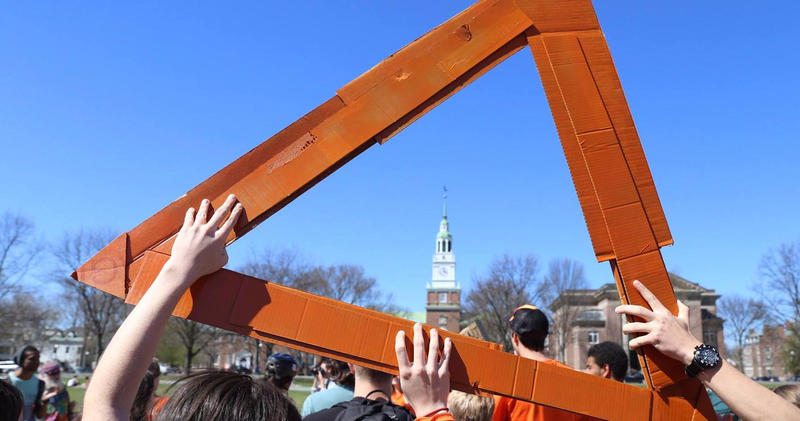 In April of 2016, President Hanlon commissioned an unbiased and objective report on the potential impacts of divestment from Thayer professor Mark Borsuk, in response to pressure from the students of Divest Dartmouth. Borsuk, who has won awards for his analytical decision modeling strategies, concluded that any level of fossil fuel divestment is objectively beneficial for the College; the worst course of action is to do nothing. Ostensibly in response to Borsuk’s report, the College published an alternative pro/con list on the impacts of fossil fuel divestment – one that lists four benefits and seven disadvantages. Borsuk’s report is 36 pages long, cites 42 sources, and is based on expert decision-making metrics explained throughout the paper. Dartmouth’s alternative is two pages long, with one cited source. It is an insult, not only to the divestment campaign, but to the educational standards of Dartmouth College. Rife with flawed logic and exhibiting an ignorance of the fossil fuel industry, the effects of divestment, global sustainability, and climate change in general, it would likely receive a failing grade in any classroom here. Our group, determined to run a professional and informed campaign, has interacted with the College on the administration’s terms. We have attended dozens of President Hanlon’s office hours. Last month, we built a “Keystone pipeline” out of Keystone Light beer cans during Dimensions, when prospective students were visiting campus, to raise awareness of Dartmouth’s refusal to divest. This op-ed is the latest in a long line of scathing critiques of Dartmouth’s short-sighted lack of transparency. What’s more, the students of Dartmouth College support our movement. An online petition for the cause carries over 2500 signatures, and a divestment rally hosted last April was not only the most co-sponsored event by Dartmouth organizations in the College’s history, but the largest documented climate rally in the state of New Hampshire. The College has responded with apathy, condescension, and stall tactics. After our climate rally garnered national media attention in April of 2016, President Hanlon finally agreed to an on-the-record meeting while the Trustees were in town for the Fall 2016 Board meeting – five years after we had originally requested one. At this meeting, the Trustees continually reiterated the arguments published in the administration-authored two-page report, though the students present had provided evidence against those claims at the beginning of the discussion. In addition, President Hanlon continues to argue that divestment is unnecessary due to the College’s other sustainability initiatives. While the Divest campaign applauds the College’s recent sustainability efforts – such as committing to switch from No. 6 fuel oil to sustainable energy sources – it is irrational to claim that such efforts somehow counterbalance the impact of our fossil fuel investments. In the face of overwhelming student support, objective logic, and moral urgency, the administration of the College has refused to take action. This passivity can only be explained by overwhelming and willful ignorance – a grievous offense indeed for a college that prides itself on academic rigor. Our movement is neither radical nor unreasoned, but founded on values and concerns shared by all affiliated with the College. Yet our future remains tied to a corrupt industry intent on destruction. We demand more. We demand responsibility from those in power. We demand transparency. We demand meaningful conversation between those at the head of this institution and those that compose its body. We demand that facts be accepted and logic respected. Our past is fixed behind us. We demand the right to shape our future.